Pompey target Jamie Hanson has been offered a new deal at Derby County. 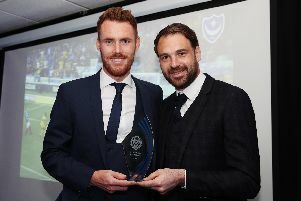 The midfielder has been targeted for a loan move to Fratton Park in the January transfer window as Kenny Jackett bids to improve his options in the centre of the park. Danny Rose's broken leg means he's unlikely to feature again this season, while Stuart O'Keefe's return from a groin problem has been scheduled for April. In addition, Adam May, who stepped in to fill the void against Shrewsbury at the weekend, was sent off and will miss this Saturday's game against Doncaster Rovers. Yesterday, Pompey completed a loan move for Spurs youngster Anton Walkes - a player who can operate in midfield. Jackett, however, remains keen to bolster his midfield ranks, with Hanson an option. The 22-year-old, who is out of contract at the end of the season, has only made one Rams appearance this term - coming off the bench in Derby's FA Cup defeat against Manchester United this month. He has been an unused substitute in Gary Rowett's side's past two matches as they too contend with injuries in midfield. But, according to Rowett, Hanson's a player he's keen to have around at Pride Park. 'Jamie is out of contract at the end of the season and he has been offered a new deal,' Rowett told the Derby Telegraph. Hanson has played 28 times for Derby and had a loan spell at Wigan Athletic last season.